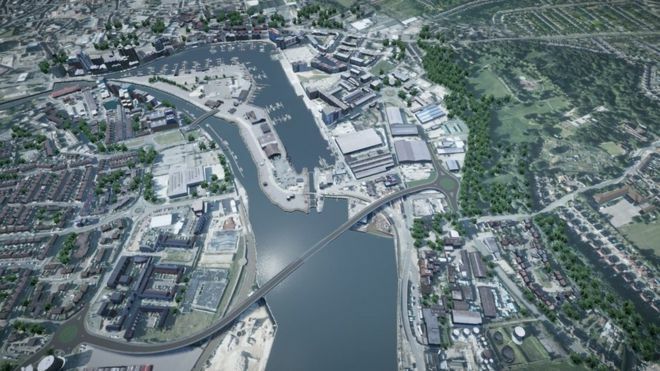 Suffolk County Council is set to scrap plans to build three bridges on the River Orwell in Ipswich, despite having already spent £8.3m in development costs. Dropping the scheme also means the council will lose the promised £78m of potential Government funding allocated to the works. A report on the Upper Orwell Crossings project to the council’s cabinet recommends stopping the project with immediate effect, on the grounds that the council has been unable to obtain the additional funding of up to £43m required. A review by Jacobs last autumn had identified a significant cost increase, after which the project was ‘paused’. The report to councillors states: ‘The estimated cost in the Outline Business Case was £96.649m. The Jacob’s Report has confirmed that the latest estimated cost falls between the range of £121.553m to £139.785m. The main planned bridge would be cancelled outright, while the council will continue to seek funding for the two smaller bridges onto Wet Dock Island, one of which would involve the refurbishment of an existing bridge. The report acknowledges that ‘the DfT funding of £77.546m to the project will be lost to Ipswich if the project does not proceed’. In addition, the council report notes that £3.6m revenue and further £4.7m of capital funding has been spent (or committed) on the project. The report adds: ‘The largest component of the spend which has occurred is the use of external experts and contractors (c£7.3m) and covers items such as external members of the project, ground investigation and insurance. The second largest item is the in-house project team itself (£520k)’. Matthew Hicks, council leader and cabinet member for economic development and infrastructure, said: ‘We are still prepared to commit financially towards the costs of building the two smaller bridges, providing we can find significant funding partners to work with us and up to a maximum of £10.8m, which respects the overall commitment we made in 2016 towards the local contribution, less the costs incurred to date. The council said the cost increase was ‘due to a range of factors including ground investigation costs, changes in bridge design post consultation and unforeseen procurement costs’. The council’s cabinet will consider the report next Tuesday (29 January). Highways has approached the DfT for comment.